Nobody is perfect, and a little while ago one of our team removed an air freshener from a car while valeting it. Unfortunately he put it back upside-down and the essential oils ran down the dashboard. We were actually unsurprised by the damage it caused to the painted plastic trim as we have seen many cars with this kind of problem. I'm sure you are wondering... we took full responsibility for the damage caused, and had OCS replace the damaged piece of trim. Great care should be taken with air freshners that contain a liquid fragrance, spillages can be costly! We were lucky on this occassion that the peice of trim was removable. A few days before this a customer brought a car to us with air freshener damage, this time from the famous 'Magic Tree'. As these are so well known and so widely used you would think that they would be safe, bat they aren't. They are okay if you hang them from your rear-view-mirror because then they won't be touching anything. But People hate having them dangling about when they are driving and so attach them some place more discreet, often hanging over the dash. As you can see from the photos below, the essential oils in them will eat into plastic. 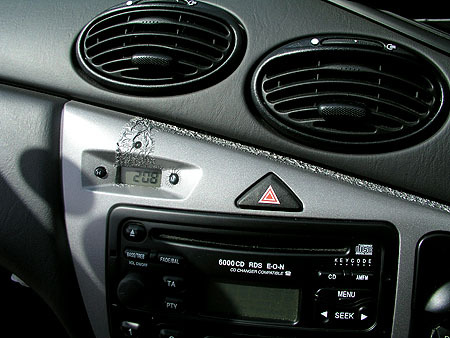 The other type of air freshner that can be a problem are the ones that have double sided sticky tape on them. It's not a good idea to put any stickers on your dashboard. The solvents from the adhesive can migrate into the dashboard leaving them swollen and discoloured. We don't advise against air freshners, but you do have to be careful with them.